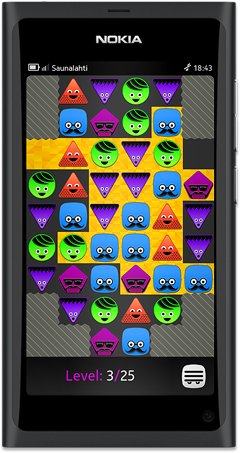 Heebo is an adaptation of the classic Match-3 genre puzzle game for the Nokia N9, newer Nokia Symbian phones and Jolla phones. Align the quirky Heebos into lines of three or more to turn the background into golden tiles. When all the background tiles are changed you win the level! Simple but highly addictive! Swap the blocks by flicking over them. You can only swap blocks when either one of them will line up with three or more in a line. TIP: If you explode more than three blocks in a line, a bonus background tile with a same colour block on it will be turned into gold. This is handy to get to those last hard-to-reach tiles! Since the Nokia Ovi Store has been discontinued, you can get Heebo for Symbian phones in the Opera Mobile Store. For Nokia N9 or MeeGo systems you can click this link to download the software package file and install it manually: heebo_1.2.0_armel.deb. Since January 8, 2014, it is also available in the Jolla Store. For any bugs or other issues just e-mail mats@sjoberg.fi. The source code is released under GPLv3 and the graphics is licensed under CC-BY-SA. The most recent source code can be fetched from the git repository. The source code for the Jolla port is available at https://github.com/kimmoli/heebo. Available in the Opera Mobile Store (September 2015): since the Nokia Ovi Store has been discontinued Heebo was made available on the Opera Mobile Store for Symbian users. Available in the Jolla store (January 8, 2014): thanks to the work by @LiKimmo and others in the Maemo forums a port of Heebo for Jolla is now available in the Jolla store. First Symbian release (June 4, 2012): a version of Heebo for newer Nokia Symbian phones (Anna and Belle operating systems) was released. We charge 1€ for the Symbian version, but the software is free and open source as always! Updated to version 1.2 (March 14, 2012): 10 new levels with double-locked blocks. Fixed cosmetic problems due to new font in Harmattan PR 1.2. Fixed bug where "no more moves" was not checked on level initialisation. Updated to version 1.1 (Dec 27, 2011): 15 new levels with locked blocks. Bug fix for rare situation where a block would get misaligned with the grid.